Firstly, it must be said that Animerica has consistently been the unquestioned leader in the field of anime print magazines in North America - not because it is the best magazine on the market, but rather because it's the only magazine that reaches a wide enough audience. Protoculture Addicts is by far the most fan-oriented magazine still being published, and there have been a number of great tries in the past that have just not survived the long haul. 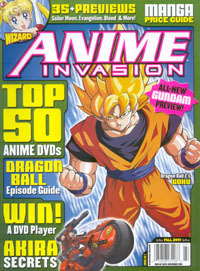 With that comes the latest entry into this long line of magazines, Wizard: Anime Invasion. The first thing that hit me when I opened the magazine were the vibrant ads. There are just so many of them, with everything from brand new anime series to manga back issues and even collectible card game cards and character busts. Sure, some don't like ads, but they sure do help round out this 88 page periodical by giving some really interesting distractions to look at as you make your way to the actual content. The first thing I read in any magazine is what the editor has to say, and this one was no exception. Douglas Goldstein's origin story is one that many anime fans can relate to -- a friend talked him into seeing Akira and it changed his life. The story lends itself perfectly to the intention of this new magazine, and Douglas says it best when he ends with, "always try new things, because you never know what you like until you try it." As I flipped through the pages, the next thing to came to my mind was the fact that this magazine sure has the Wizard dramatic flair. Everything from the layout of the text to the fonts and picture arrangement screams that special kind of 'Wizard class'. Herein lies one problem with the magazine: Wizard has one of those truly functional layout designs that works no matter how short the article, but the content of past Wizard spin-offs have done nothing but dry up if it's not crutched by a price guide -- which this magazine does have. Cynicism aside, there are some truly original ideas presented in this magazine like the 'Death of the Month', which showcases the final moments of Mushizo, a.k.a. the wasp guy from Ninja Scroll in this issue. What about interviews and in-depth stuff? Anime Invasion definitely has those, but filling up the brunt of the magazine are pages of two- and three-paragraph mini-articles with the occasional page-length article, like an interview with Katsuya Terama, the Blood: The Last Vampire character designer, which gives some insight into just what he thought about the movie. There is even the latest incarnation of Wizard's versus battle article "Last Man Standing", which features a bout between Wing Gundam Zero and Eva Unit 01. It isn't until page 24 that you get the first true full-length article entitled "Land of Confusion", which is one of those beginner guides that almost every anime fan wishes they had when they were first getting started. Stranger still, I got a feeling of deja vu that I had read this article before, but for the life of me I can't place it. From there, the hits just keep on coming with a list of the Top 50 coolest anime movies and series of all time entitled "Beasts from the East", which will more than likely make you shake your head in disagreement at some of the show rankings. Keep in mind that this list is horribly skewed to only showcasing shows that have appeared domestically. Interestingly enough, Dragon Ball Z ranked number 6 and Sailor Moon was 27--there must be some kind of conspiracy there. There is also an article entitled "Too Hot For TV!" which is a look at some of the changes that anime series have gone through in their transition to American television. Still, the big pull for the magazine are the two cover features on Akira and Dragon Ball, each of which have their own cover variation to choose from. The Akira article is a well-written comparison of the manga to the anime which serves as a lengthier version to a similar story which ran in Wizard #67. Again, it's nothing you can't find on the net, but it is worth a read… especially to see some of the original Marvel/Epic colorized versions of the manga panels if all you are familiar with is the recent Dark Horse re-release of the manga. On the DB front, the article is a little weak. There is simply an episode guide of the first two story arcs of Dragon Ball with some character info on the side. Anime is a huge field, but if you constantly only try to hit the mainstream, you only end up catering to the pop culture market, and that can mean the difference between a successful magazine and a dead one. I will give the magazine this much credit though -- when Wizard first began running a monthly column named 'Manga Scene', it was one of the most informative and well-written looks at various aspects of anime and manga that I have read. Since then, the column has become nothing more than a monthly anime and manga spotlight with more than a couple pieces of misinformation. It's nice to finally see some well-researched and lengthy articles from Wizard concerning anime. So is Anime Invasion worth the cover price of $4.99 USD? Only if you are an obsessed collector or someone with a thing for mainstream anime. It's a lot better than a Pojo Magazine, and it's a nice item to tuck away with your copy of the TIME Magazine that featured Pokemon. Now, which cover are you going to pick: Akira or Dragon Ball Z?